Cities Connection Project | GSC BLACK HOUSE. CAGIALLO. The project’s concept born from the desire of empha- size the contextual elements, in particular the singular morphology of the plot, the nearby forest, the old Saint Matteo’s Church, and the extraordinary view of the Lu- gano’s lake. The plot is characterized by a double slope: the traditional up/down and another one in the east- west direction, due to a pre-existent street. 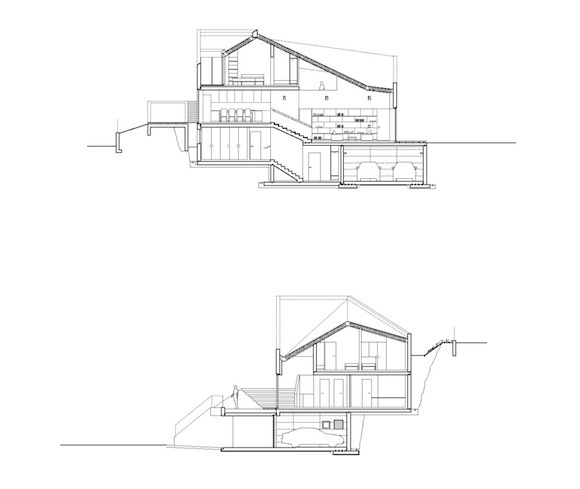 The natural land section has been kept and it has been slightly ge- ometrized, splitting the house in two semi-levels with a continue contiguity between inside and outside. 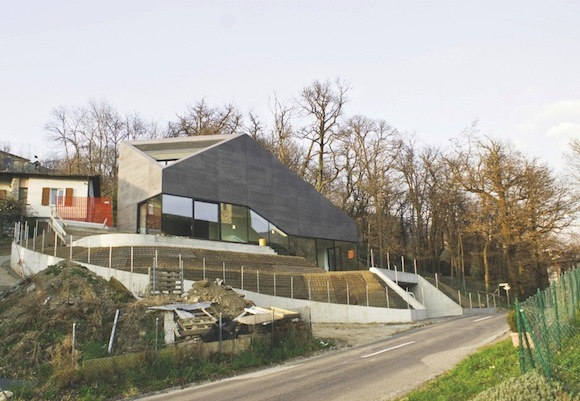 The composition of the facades were created based on the legal context from the city asking a traditional pitched roof. We have decided to repeat the pitched roof on each facade (east, south and also in the north-west corner). With that, we achieved a complex tri-dimensional shape starting from a simple bi-dimensional geometry. This complexity adapt itself also for another characteristic of the plot: to have a street on each side. Thanks to those streets people can walk all around the building and have a dynamic perception of the shape: from each point of observation the house seems to change. To allow a 180° view of the natural context, the ground floor has been completely cut with a 15 m cantilever beams flying over a completely glass wall. That solution was possible because the pitched shape coincide with the structural efforts of the framework concept, optimizing the distribution of the efforts. From a functional point of view on the ground floor there are living areas (living-room, a small studio, dining-room and open kitchen) where in the structural upper floor, you will find three bedrooms and two bathrooms. The optic perception of the rooms while walking through the inte- rior is that spaces are continuously changing its propor- tion, offering an unique view.